The Black Kuhlii Loach (Pangio sp.) aka “Java Loach” is only one of over 100 species of loaches in the Cobitidae family. The Java Loach (Pangio oblonga) is also known to tropical fish keeping enthusiasts as the Black Kuhli Loach or “unbanded loach“, the Chocolate Kuhli Loach, Cinnamon Loach and Black Khliwaus. The Java Loach (Pangio oblonga) was first discovered in 1846. They are found in Vietnam, Laos, Cambodia, Thailand, Malaysia, Indonesia and possibly in India, Myanmar and Bangladesh. Both are shy, peacefull, nocturnal bottom dwellers that do better with at least 3 or 4 of their own kind in an aquarium setting. They are more active at night when they are picking around the tank looking for tidbits of uneaten food. They are excellent additions to peaceful community tanks. 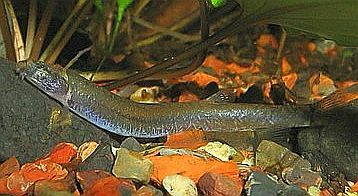 The Black Kuhli Loach (Pangio oblonga) is colored a reddish brown to black on its body, with a slightly lighter underside. There is a single black bar at the base of the tail. They have reduced or no scales and their mouths are surrounded by barbels that are used to sense and taste food. The Black Kuhli Loaches behavior is typical of the Pangio genus. They spend much of their time actively scurrying around, over, and through the plants and decorations at the bottom of the aquarium scavenging for leftover foods that settle on the bottom of the tank. They are great little helpers and aid in aquarium maintenance of a community tank. At times they will lie on their sides and give the impression that they are ill. This is normal behavior for these fish and is done when they have insufficient hiding places in their tank. These loaches like planted tanks with driftwood, rocks, plant roots and caves to explore and hide in. 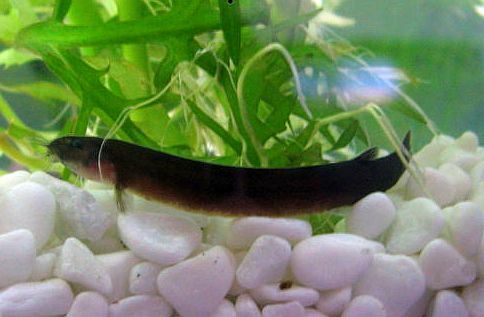 Black Kuhli Loaches can grow to almost 4″ in length and are sensitive to inferior water quality. They should only be introduced into established aquariums; never in a newly set up tank. Once established, they are easy to care for and get along well with their tank mates. In their natural habitat Black Kuhli Loaches live in the shallow sandy areas of rivers and streams around shore vegetation and leaf debris. These loaches normally frequent the shallow, sluggish areas of the streams and probably move into the flooded fields during the high water season. Black Kuhli Loaches are not normally schooling fish but they do live in clusters of scattered indifiduals. , small inverts and brine shrimp along with its diet of commercial flake food. To date, breeding the Black Kuhli Loach in captivity by any tropical fish keeping enthusiast has not been documented. When they are available for purchase, Black Kuhli Loaches are usually 1-1/2″ to 3″ in length.